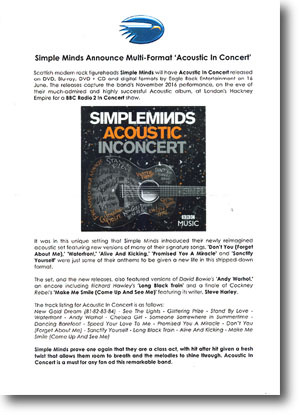 Scottish modern rock figureheads Simple Minds will have Acoustic In Concert released on DVD, Blu-Ray, DVD + CD and digital formats by Eagle Rock Entertainment on 16 June. The releases capture the band's November 2016 performance on the eve of their much-admired and highly successful Acoustic album, at London's Hackney Empire for a BBC Radio 2 In Concert show. 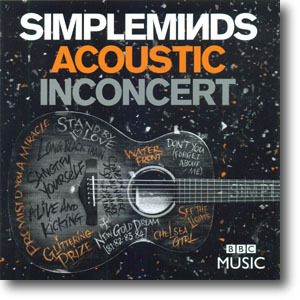 It was in this unique setting that Simple Minds introduced their newly reimagined acoustic set featuring new versions of many of their signature songs. Don't You (Forget About Me), Waterfront, Alive And Kicking, Promised You A Miracle and Sanctify Yourself are just some of their anthems to be given a new life in this stripped-down format. The set, and the new releases, also featured versions of David Bowie's Andy Warhol, an encore included Richard Hawley's Long Black Train and a finale of Cockney Rebel's Make Me Smile (Come Up And See Me) featuring its writer Steve Harley. The track listing for Acoustic In Concert is as follows: New Gold Dream (81,82,83,84), See The Lights, Glittering Prize, Stand By Love, Waterfront, Andy Warhol, Chelsea Girl, Someone Somewhere In Summertime, Dancing Barefoot, Speed Your Love To Me, Promised You A Miracle, Don't You (Forget About Me), Sanctify Yourself, Long Black Train, Alive And Kicking, Make Me Smile (Come Up And See Me). Simple Minds prove one again that they are a class act, with hit after hit given a fresh twisst that allows them room to breath and the melodies to shine through. Acoustic In Concert is a must for any fan of this remarkable band.